Please refer to our stock # T 1825 when inquiring. Doubled up this would make a fine doll necklace. All metal is sterling silver. 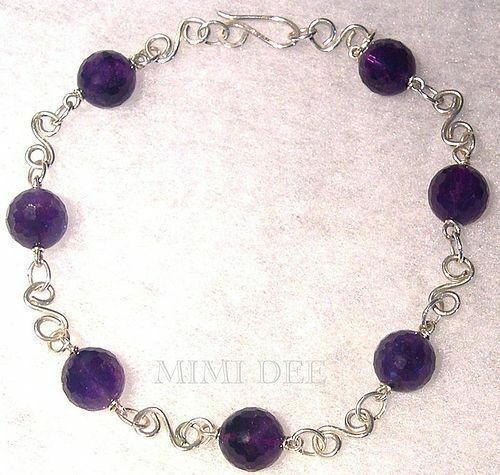 In a USA studio this choker necklace was made with 175 carats of 7 faceted 15mm rich juicy dark plum faceted amethyst beads from far away lands with hand hammered silver by and signed: Handmade, Mimi Dee and Sterling. Length: 16", yet will add a couple of jump rings if needed free of charge. Each beautiful semiprecious bead threaded with 14 gauge precious metal for safety. Not thin wimpy gauge. Have you ever noticed that most do not mention the sterling weight? Beware of thin metal. No cable to break! All real, no faux here! Own the only one! Please examine images to appreciate then have this mystical healing gemstone adorn your neck! $18 USPS Priority/Ins/Track and Signature or FREE with USA Ck or USPS MO. This signed studio metalwork jewelry artist who also paints oils/ acrylics has made fiber art to wear garments in the past and does not duplicate, has exhibited in various juried shows, more recently since 1990 and at the previously open Methuen studio store gallery by the same name. A note about precious metal prices and jewelry in general. With metal prices going up, many use plated metal with their "stones" and ask exorbitant fees for their mass produced product. Here for less the money you get the genuine gems and metals...and "one of"...no duplicates! Consider commissioning a hand painted presentation box for this and make this a truly special gift for yourself or the one you love.